The junior class officers and advisors take a picture with the tree. Photo by H.Carnahan/Setonian. The annual Junior Class Tree Planting Ceremony was held on April 21 on Administration Front Lawn. While this event is tradition every year, this year was special, as the Class of 2018 will be the 100th class to graduate from Seton Hill University. The planted tree is a Crimson King Maple, chosen to supersede another tree in the same location that fell down last year. Scognamiglio also described the importance of the location of the tree: not only is it replacing the old tree, but it is also front and center on campus. 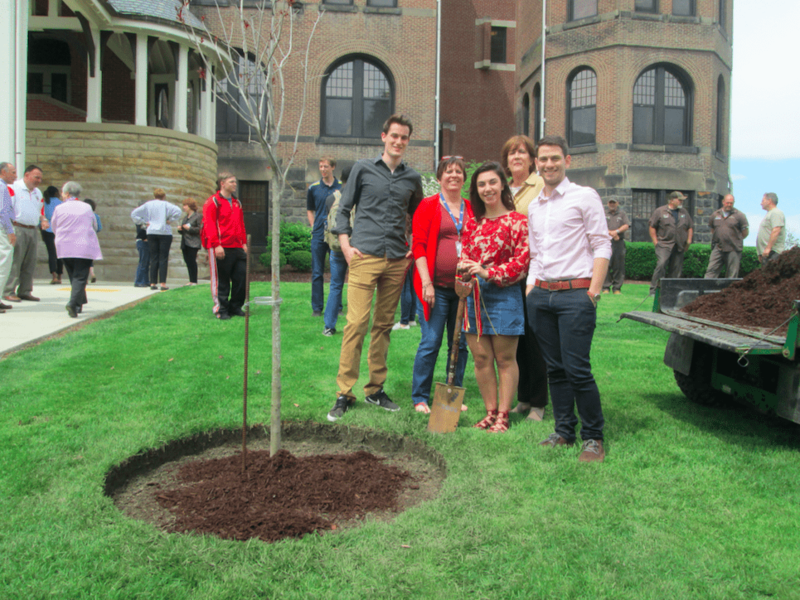 “I feel it was a perfect choice because this tree will have yellow and gold leaves [in the fall], so it will be perfect to commemorate the 100th ‘golden’ graduate class,” said Scognamiglio. Bill Black, SHU archivist and professor, gave opening remarks along with SHU President Mary Finger. “This is one of the more sacred spots on campus. I would like to point out that when Mother Lowe, when she first came to Seton Hill, this was only 12 acres of the 200 that was still forested on the other side,” said Black. According to photographs found in the archives, the yellow wood tree was planted while the Administration Building was being built. This tree is from when Mother Superior Aloysia Lowe of the Sisters of Charity was still alive in the 1880s. Sister Maureen O’Brien gave a blessing on the tree, praying the tree’s roots grow as deep as the students’ roots do on campus. While the chosen tree will be a sapling, it will eventually grow to be between 35 feet and 45 feet, at an average growing rate of two feet per year. The tradition for the Junior Tree Planting Ceremony started in 1920, in addition to a Senior Ivy Planting at Lowe Hall. The ivy planting has since ended since it proved to be destructive to the walls of Lowe, but trees are still planted every year. Click here to view more photos of the tree planting ceremony. Click here to read Annie Meyer’s article about the Nature Club’s seed planting event. UPDATE: An earlier version of this story listed Anna Graziano as junior class vice president, which is incorrect. The story has been updated with Graziano’s correct title of junior class president.